March....wow. Sure came up fast! March reminded me of a local music event called "Marching On". 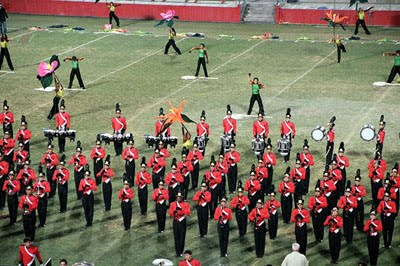 My son was in an amazing high school marching band that is quite famous in California, the James Logan Marching Band. The high school itself has just over 4,000 students so the band, plus color guard (flag twirlers/dancers), totals over 200 performers. They were and still are the largest band of its kind over here. This second photo shows just the trumpet section, 35 of them! My son is in there SOMEwhere. Each year they and the other local school bands performed in an event called Marching On where everyone displayed their talents. To see this band just march onto the field is an awesome site at 220 strong! They would always be the last band due to their size and for 11 straight years they have held onto their championship status in the WBA. They work hard for it, though! To be as good as they are with that many kids is a feat that is managed by a super duper team of teachers that are committed to excellence. I had NO idea what a big deal this group was until my son took his first out of town band trip. I drove him to the school, dropped him off, then as I turned a corner, I saw, for the first time, their SEMI-trailer truck set up to carry all the band equipment! Seeing a professionally applied banner on the side of this gigantic truck just blew my mind...this was serious stuff! Dang. no wonder they had to get there so early...they had to load that truck! I got choked up with pride...really, I did. I spent 2 seasons helping to set up food tables at band competitions so that these kids could have a hot meal. But really, the most wonderful part for me was watching their bi-weekly rehearsals after school and listening to the choreographer over the p.a. system (the band was so huge, the guy needed to use the p.a. system to talk to all of them!) guiding each section work out their marching drill. To be able to play an instrument well shows talent...to do it while marching in a neat and specific pattern is genius. These are NOT band geeks! They still use that term amongst themselves, but these kids played neat and tight and near professional level. Their band director was very strict. I don't know HOW he got them to do so well when many of them said they didn't really like his manner much. He did SOMEthing right to keep them champions for 11 years! I did experience this sour feeling once when I saw and heard him chastising a boy for wearing a suit and not a tuxedo. They were outside the band room, with kids coming and going and EVERYone heard him embarrass this kid...it was kind of awful. Once when my son couldn't march for several weeks, I told him we would attend one of the local competitions so he could experience just how good the band was. Watching videos just didn't capture their sound. He said that his band director never showed them videos because if we decided we thought we were really good, we could easily get lazy. I said tough, we are going. That night, we climbed the stands at San Jose State stadium and wrapped ourselves in blankets. We sat way up high so he could have that fabulous view of his band. Out they marched and then performed. He was completely silent. When they finished I said, "well, what did you think?". He replied "wow...we are really GOOD!" I said, "See? You should KNOW that for your SELF! Wasn't it great how the flag twirlers were in sync with the band"? He replied, wide eyed, "I was only watching my trumpet section!" I loved that he was in awe of his band. So was I!